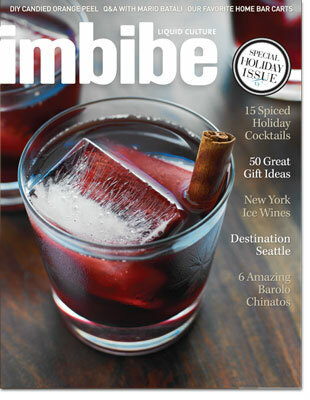 Over the past few years at Imbibe, I’ve had the chance to write about the cocktail situation in Las Vegas and San Francisco, Los Angeles and Vancouver. But it wasn’t until the current issue (which appeared in mailboxes last month — hey, I’ve been busy) that I finally had the opportunity, or the excuse, to officially roll through many of the craft-cocktail bars in my own hometown of Seattle. (The November/December issue is still available on the shelf, or if you need to read the Seattle piece RIGHT NOW, here’s a link to a PDF copy?— but really, get the magazine). One of the drawbacks of these kinds of stories is that I never have enough space to fully recognize some of the more noteworthy bars and the talented bartenders that I come across. In the print version of the story, I included recipes from Erik Hakkinen at Zig Zag Café, Eric Carlson at Moshi Moshi, and Jay Kuehner at Sambar, but these are only a few of the bartenders who have made Seattle into the city it is today: a soggy, Ramazzotti-soaked destination for the cocktail enthusiast and/or the discerning inebriate. But whaddaya know — I have a blog, a little rusty from recent disuse but as far as I can tell, still functional (knock wood). So over the next week or so — emphasis on the “or so” — I’m going to run a few notes and recipes from bars and bartenders I may have mentioned in the article, but didn’t have a chance to fully recognize. First on this mini-tour of Seattle bars is a place that I first visited not long after I moved to Seattle in 1998: Vito’s, on First Hill. Vito’s has been around since the 1950s, and the décor seems to hardly have changed since its debut (don’t believe me? Check out the Cougar Room in the back). 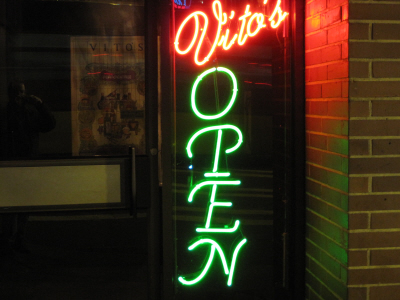 In the late ‘90s, Vito’s was a fun if slightly down-at-heel kind of place to spend a Saturday night; more recently, the bar had a run of bad luck, and the memories it inspired started trending to the “I almost got shot there” variety. But last year, new owners started cleaning the place up, keeping the non-ironic retro furniture and the edge-of-downtown aura to the place, but spiffing up the menu and the music and just generally getting Vito’s vibe and clientele back into more-or-less respectable territory. Even better — at least from a cocktail-geek’s perspective — the bar’s booze selection was seriously rethought. Sure, you can still get a can of Oly and a shot of well whiskey at the bar, but Vito’s is reflecting its Italian influence with more than just the eggplant parm; bottles of Italian aperitifs, spirits and liqueurs such as Zucca Rubarbaro, Strega and Barolo Chinato now populate the back bar, and the bar menu has a serious drink-geek’s touch, with cocktails such as the Waldorf & Statler, made with gin, falernum and Fernet Branca; the Akimbo, a rye, Campari and Barolo Chinato drink not on the current menu but worthy of a return engagement; and the Tom Handy, a Sazerac interpretation made with Rittenhouse rye and Remy VSOP, spiced with The Bitter Truth Creole Bitters. The drinks take an East Coast, spirit-forward approach, and this winter Vito’s is even serving Smith & Cross-fuelled Tom & Jerrys, the first regular appearance of these I’ve seen in a Seattle bar. Still, Vito’s is not immune from misfortune, as is demonstrated by my Imbibe story: ?while I recognized bartenders Jared Scarr and Nabil Sherief for their work behind the bar, somewhere in my fuzzy joy at finding that Vito’s had cleaned up and had taken the craft-cocktail pledge, I accidentally gave Jared a promotion to bar manager, overlooking the man who’s done the most to turn Vito’s beverage program around: Justin Gerardy.-- So here, in front of the Internet and everybody, I offer my apologies to Justin, and as testament to the skill of Vito’s bar staff, I offer you one of the establishment’s original drinks (developed by barman Connor O’Brien and named by Gerardy), To Hell With Spain. Combine ingredients in a mixing glass and fill with ice. Stir well until chilled, about 30 seconds. 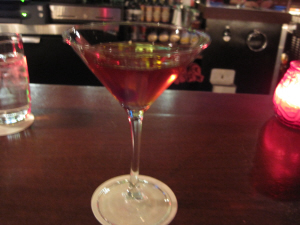 Strain into chilled cocktail glass; garnish with a cherry. “Remember the Maine, To Hell with Spain” — get the connection? This is the Remember the Maine’s smoky Scottish cousin, with the peaty complexity supplied both by the new-ish Johnny Walker Double Black, which carries an extra payload of Islay malt in its blend; and by a touch of Laphroaig, just to keep the fire burning. Cherry Heering, Carpano and absinthe are burly enough characters to take a little smoke in stride, and the result is a powerfully flavored, richly alluring cocktail. As Gerardy says, “I tend to be most interested in a drink that references its ingredients, rather than tries to redefine those flavors. When you do that, some of the reverence for that is lost.” No worries of anything getting lost in this mix – it’s one I’ll come back to, especially as the season gets darker and colder.